WTLV WJXX recently aired the "Life By Accident" story. See it below. TISIRI divers encounter aircraft wreckage offshore St. Augustine Florida and begin an investigation. 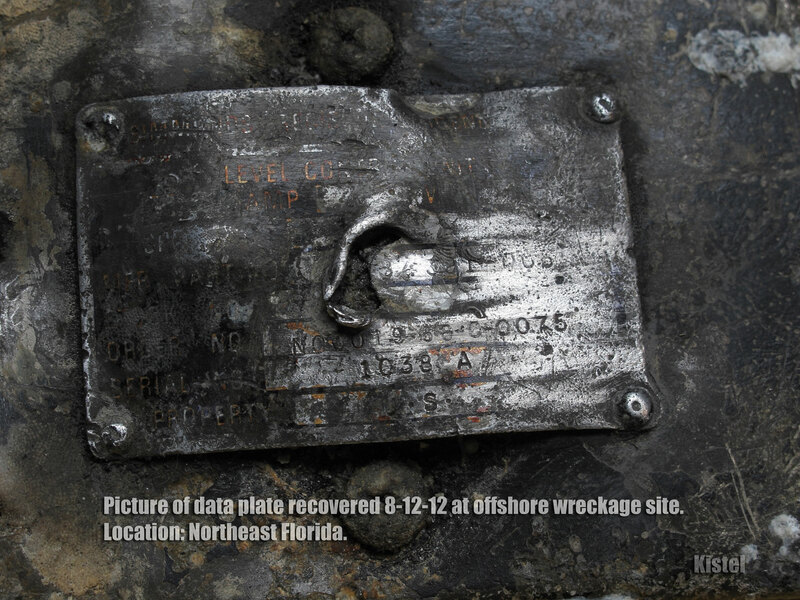 After several scuba diving surveys a data plate is discovered that says "Property of US." The data plate is ultimately cleaned ad more information is obtained. It is the determined that the aircraft is an A7 that crashed back in 1974. The pilot, Robert Besal, was able to eject safely and serve out a decorated navy career. The TISIRI team reached out to retired Rear Admiral Besal informing him they have found his plane. Besal made the visit to St. Augustine and the TISIRI team led him out to the area where the now reef resides. Jessica Clark's full story can be found here. What a story! I’m glad the pilot survived the crash and this story had a happy ending. Wow, not many people are able to walk away from a mid air collision. Great story.